The start of the Seville Marathon (Zurich Maratón de Sevilla) 2019 is located on Avenue of Carlos III (Avenida de Carlos III) near the Seville Olympic Stadium (Estadio Olímpico de la Cartuja). The finish of the race is on the lanes of the Seville Olympic Stadium (Estadio Olímpico de la Cartuja). On the route playing music bands and DJs. At the Seville Marathon (Zurich Maratón de Sevilla) 2019, the service of pacemakers is provided. Pacemakers are located in the starting blocks and can be identified by the balls with the marked finish time and special T-shirts. Forecast finish times for the marathon: 2:45, 3:00, 3:15, 3:30, 3:45, 4:00, 4:30 and 5:00. The refreshment and food points are located every 2.5 km of the Seville Marathon (Zurich Maratón de Sevilla) 2019, starting from the 5th km, and at the finish, water is offered in each of them. Isotonic distribute in points at marks 7.5, 12.5, 17.5, 22.5, 27.5, 32.5 and 37.5 km; snacks - from a mark of 22.5 km, gel - at a mark of 27.5 km. Refreshment sponges are located at 17.5 and 27.5 km. You can leave your personal belongings before the start at the Seville Olympic Stadium (Estadio Olímpico de la Cartuja), Gate N (Puerta N) near the Northern Tunnel (Túnel Norte). The wardrobe is located 800 meters from the start area and 400 meters from the finish, from 6:45 to 15:00 on February 17, 2019 (Sunday). Things must be packed in a special bag, which is included in the starter pack and is issued along with the starting number. Read more here. 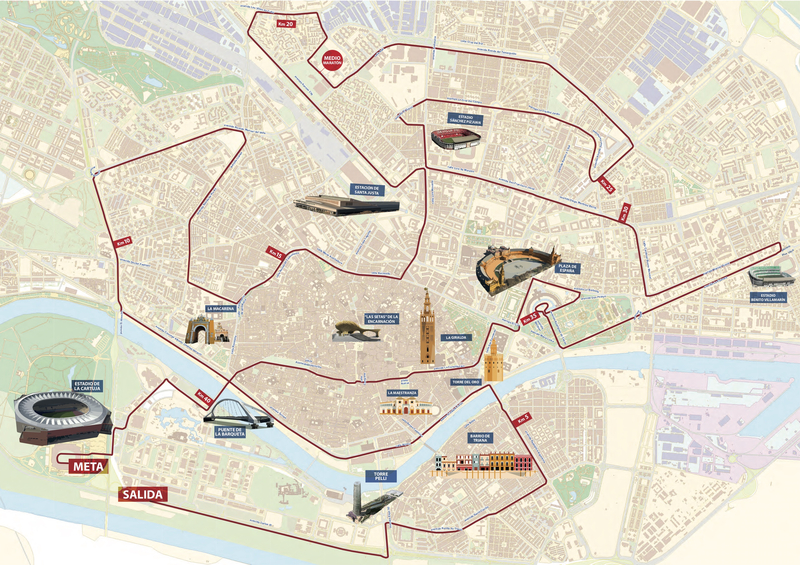 The route of the Seville Marathon (Zurich Maratón de Sevilla) 2019 is certified by AIMS. The marathon has the golden status of the International Association of Athletics Federations (IAAF Gold Label Road Races). Cracking event! Not big and flash but well run with plenty of passion. Pancake flat. Inexpensive and convenient flights from LGW. Airport very close to very attractive city. And yesterday's event enjoyed glorious weather too. Excellent w/e away. stewie, thanks for the feedback. Having enjoyed events in Valencia and Barcelona (and heard good things about Seville too), this one is definitely on my list for a future year. Glad you had such a good weekend!